Th-INK-ing of You: LOC Silk Moth... Beautiful! Hello again friends! It's time for another Stampin Sisters in Christ challenge! Today, our hostess is sweet Peggysue! She has chosen 1 Thessalonians 4:11-12 "Make it your aim to live a quiet life, to mind your own business, and to earn your own living, just as we told you before.12 In this way you will win the respect of those who are not believers, and you will not have to depend on anyone for what you need." Her challenge is "Nothing bright. Use 'quiet' colors in your creation, either pastels, or low key earthtones, soft, muted shades of beige or neutrals." My card is made with the summer release from Layers of Color! I just fell in love with this image! It's the Silk Moth Cling Stamp. I stamped it on Cryogen white and colored with Copics (B72, B75, B78, & Y28). Because I used Cryogen there is a little sparkle to it, though the picture doesn't show that. My base is from Mark's Finest Papers, and the matting is SU! Baja Breeze. The designer paper is from a GORGEOUS new DCWV Pack, Mariposa! I ran it through the Big Shot with a Butterfly Corner embossing folder. I sponged everything with Memento Ink in Rich Cocoa. I added a few pearls from ZVA Creative, and a little bling from M's. The lace was a gift from a dear friend, and the blue lace is some older lace I bought at a thrift store, still on the original card.... very cool! We want to thank Clear Dollar Stamps for their continued support! Be sure to check out Peggysue's devotional on the SSIC Blog, as I know you'll be blessed! Thanks so much for stopping by! I hope the ease of this card inspires you to get this gorgeous image and have some fun! Have a blessed week! What a gorgeous card Grace!! I just love your colors and that butterfly is stunning!! So beautiful!! I so need that butterfly embossing folder too!! Gorgeous GF!! Have a great day! TTYS! wow! It is wonderful! Love the butterflies on the backgrround paper. All is beautiful! Grace, wow - beautiful card. You may have used quiet colors but it screams beauty! Great EF and sponging and that silk moth is outstanding. Have a great week!! 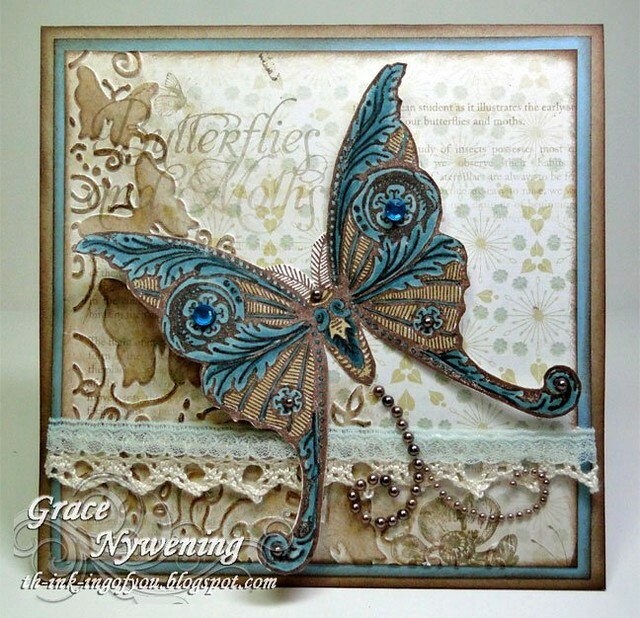 What a gorgeous butterfly..Love how you used that embossing and love the bling you used. Oh my word!! Your card is stunning. I love the butterfly. Thank you for joining us at Frsoted Designs this week. I can understand why you fell in love with that butterfly, it is gorgeous, especially with your coloring. Wishing you a blessed week! This image is just stunning Grace! I love the colors, the lace and bling too! Just another inspiring creation from you! Have a great weekend! Grace--this butterfly (moth) is absolutely gorgeous!!! I love your soft muted colors! You did a great job of coloring this beauty! Thanks for playing along with us this week at Speedy the Cat's Friends challenge! Just amazing!!! !I like it very,very much!!!! This is such a richly regal card, Grace!! I love the texture of your card, the colors, the detailed stamp image...all combine to make a real wow for the eyes!! Wishing you a wonderful, blessed, Sunday!! Amazingly beautiful! Thanks for playing along over at Frosted Designs. Oh Grace, the PEACE flourishes on your marvelous card! Blessings to you this glorious God's Day! Oh Grace, this is beautiful!! The pearl trail following ht emoth is lovely and nice embossing and colors. Love seeing your designs. WOWZA Grace this is one STUNNING creation, absolutely LOVE that butterfly!!!! TOTALLY GORGEOUS! Hope you are having a wonderful weekend! Grace, beautiful card! Love the butterflies. Thanks for joining us at Alphabet challenge this time, hope to see you again. how gorgeous this butterfly is and what a beautiful way to use bling, like a little butterfly trail. Thanks for playing with us over at Speedy the Cat's blog. Pretty, subtle and elegant. Good work! The butterfly is so pretty! what a card! That's fantastic, Grace. Thanks for joining us at Rainbow Lady. Your card is elegant and beautiful! Your card is so elegant Grace. You never cease to amaze me witht the beauty of your creations! Grace what a pretty card. I love the gems on the butterfly so pretty. Thanks for playing along with Speedy the Cat's Friends challenge this week. Hope to see you again next week. Grace, your moth is simply enchanting. The backdrop embossing with the butterflies is exquiste. The colors are amazing too. What an exquisite creation. Thank you so much for playing along with Speedy's the Cat Friend's Challenge. It is a pleasure to visit and see what you made for us! Special thanks for visiting my blog and leaving such a sweet comment. It's always nice to meet another Fibro Sister, although I wish the Fibro would go away. I absolutely LOVE the card you made today and can by your blog that you are an amazingly talented and very creative crafter. I'll bet that you enjoy it as much as I do and find it a perfect way to keep yourself busy and your mind of of Fibro!! Keep up the wonderful work! I'm now a new followers and wish you well! Wow! What a gorgeous card. What a beautiful card! Thanks for playing in the Bugaboo Challenge. Grace, this is fantastic! I missed several weeks of SSIC due to our family trip, and then lots of canning when we got home. I'm sorry this was one of them. What a lovely example of "muted doesn't mean dull"!